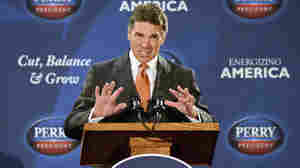 January 19, 2012  Rick Perry garnered instant front-runner status in some polls when he joined the GOP presidential race. 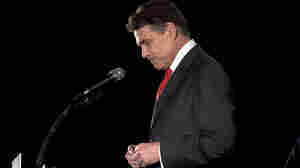 But he slid to the back of the pack after embarrassing debate performances. All along, his bid for the nomination seemed outsize. So, too, were the expectations, which ended Thursday. 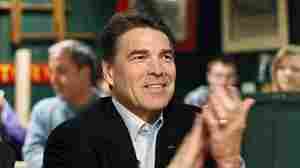 January 4, 2012  The Texas governor said he's returning home to determine whether there is a path forward for his Republican presidential campaign. He got 10 percent of the vote and finished fifth in the caucuses, the opening contest to pick a challenger to President Obama. 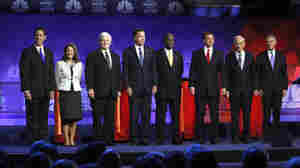 December 28, 2011  It's increasingly clear who among the six GOP candidates competing in Iowa will likely leave without a coveted win, place or show "ticket" out on Jan. 3. 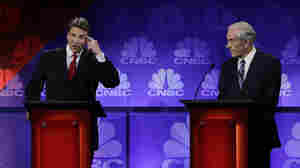 NPR traveled to Indianola, Iowa, to check out events for two once high-flying candidates: Texas Gov. 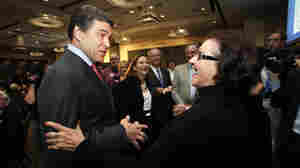 Rick Perry and Minnesota Rep. Michele Bachmann. 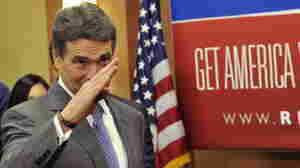 December 15, 2011  Texas Gov. 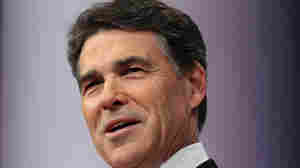 Rick Perry entered the GOP presidential race with great fanfare and immediately became a front-runner. But his candidacy quickly deflated. 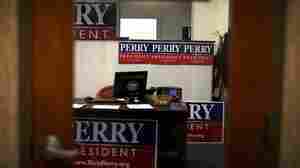 Now, Perry is trying to mount a comeback in Iowa, appealing to social conservatives with provocative ads and embarking on a bus tour of the state. December 14, 2011  He believes in cutting taxes, rolling back regulations, balancing the budget and increasing domestic energy production. 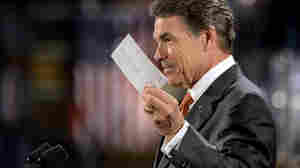 Here are a few other things politics watchers will tell you that you might not know about Perry. 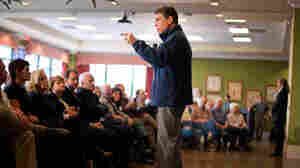 December 10, 2011  The GOP hopeful has been making a last-ditch play to keep his campaign alive by placing in the top three in Iowa, where he once topped the Republican caucus polls. A good showing in Saturday night's debate would help. 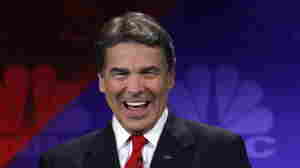 December 7, 2011  In the latest reminder that he's still in the race (if apparently not in the hunt) for the Republican presidential nomination, Texas Gov. 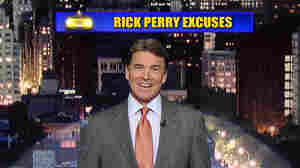 Rick Perry has a new TV ad in Iowa in which he makes a naked appeal to the state's religious conservatives who are expected to play an important role in the upcoming caucuses.